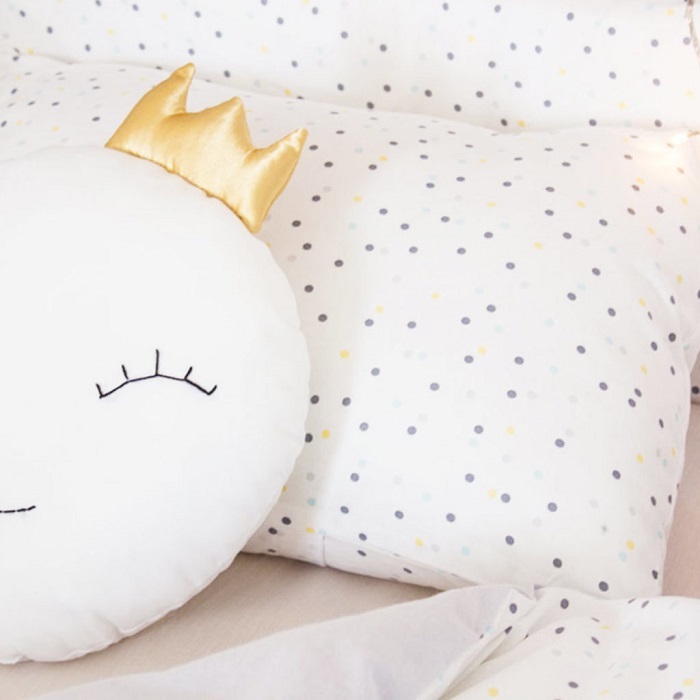 If you thought that an all-white kids room was something achievable only in a decor magazine, you’d be surprised how versatile this trend can be for kids bedrooms. Fresh, modern and bright, white goes with every other colour. This colour has the ability to make rooms look larger and brighter. Pairing well with wood and metal, as well as natural materials such as hemp, bamboo and jute, there are many different ways to make a white kids room work. Whether you are aiming for a contemporary Scandi-style monochrome room, a modern minimal boho room, a classic white room or a simple gender neutral room that can adapt to your little one’s style throughout each phase of childhood, planning an all-white room does not have to be a challenge. The first thing you may be asking yourself is whether a white kids room will stay white over the course of an average day in your busy bee’s life. This colour can be daunting – especially for those with active kids who love making a mess. The trick to using white practically is to focus on balancing white walls, furniture, rugs, decor and bedding with touches of grey, neutral, delicate patterns or splashes of colour. Here are a few ways to make this trend work. Add soft touches of neutral, natural colours. Gentle touches of soft natural colours will help to reduce the glare of white bedding, walls and furniture, by breaking up the solid colour. When paired with natural materials, a few carefully chosen decor items such as a natural hemp rug, natural seagrass belly basket or natural cot linen will add warmth to your child’s all-white room. Simple furniture in white or wood will further help to balance out a white room, and also help neutral or grey decor touches stand out more effectively. Add subtle patterns and details. Another way to break up solid white decor styles is to inject a bit of detail. Subtle patterns with white backgrounds will also prevent an all-white room from looking too harsh or clinical, while still maintaining the brightness of white as a primary decor theme. Fine polka dots are also fun, adding extra detail that further reduces the risk of an overly sterile white room. Add a funky scatter cushion to finish the look. Add a few pops of colour. The minimal boho look fuses the simplicity of white with warm touches of wood and a few pops of bright colour. Furniture, walls, floors and ceilings add a stark white palette, with small splashes of colour added here and there to liven things up a bit. Add a bold cotton rag rug, a pretty garland or funky wall decor, an assortment of mixed-and-matched scatters and a bold bin or lamp to make this look work. 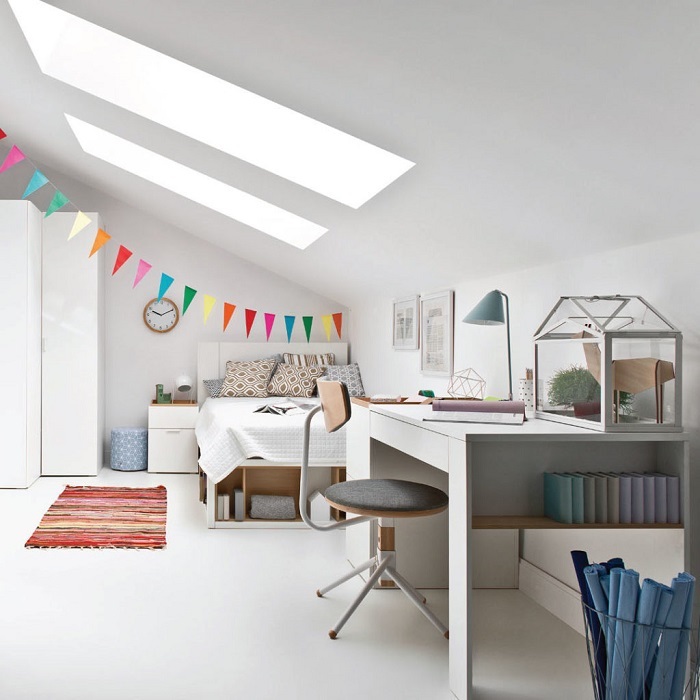 What makes white an ideal colour for a child’s bedroom is the colour’s versatility. This will help you easily change your little one’s room style quickly and easily without the risk of clashes. For more inspiration on modern decor, bedding and furniture for an all-white kids room, browse our online shop to see what we have in store.